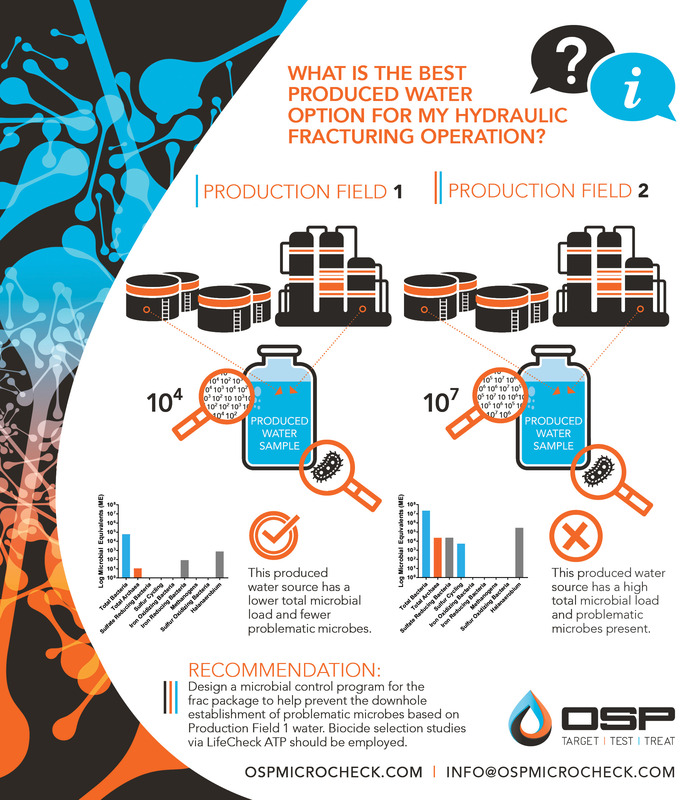 Case Study: What is the best produced water option for my hydraulic fracturing operation? OSP was engaged to complete microbial testing on two produced water options for future hydraulic fracturing operations. The OSP Technical Team tested samples from two production fields using LifeCheck ATP to determine the overall microbial load of each sample. The technical team also completed LifeCheck DNA qPCR testing to target the presence of problematic microbes. The testing concluded the best option was the Produced Water from Production Field 1 as it had a lower total microbial load and fewer problematic microbes present. The resulting recommendation was to design a microbial control program for the frac package by completing biocide selection studies via LifeCheck ATP to help prevent the establishment of problematic microbes within Production Field 1 water . Mitigating microbial growth is paramount for preventing issues such as microbiologically influenced corrosion (MIC) and souring in oil and gas applications, demanding reliable testing and a team of experts committed to your microbial mitigation strategy. At OSP we understand immediate microbial results are important for the implementation of an appropriate control program which can be challenging to achieve with lean teams or sample transportation. To help meet these challenges our OSP microbial identification and evaluation experts provide technical services, on-site or in the lab. We are committed to providing you with reliable results to support your microbial mitigation strategy. OSP provides microbial identification, evaluation and control via technology and services to ensure our clients are protecting their assets with the best information and products available in the energy industry. We are committed to providing technical testing, quality reports and reliable specialty chemical products for water-based applications in the energy industry.